Aspiring entrepreneurs often struggle with how to get started – especially if their training is in a field like music. “I don’t see myself as an entrepreneur…I’m not even sure what that means!” Entrepreneurship for musicians need not be mysterious. It’s really just a different way of looking at your world and capitalizing on opportunities. How do you develop that kind of mindset? Here are five things you can start doing that may help you think like an entrepreneur. One of my early mentors told me most of his entrepreneurial ideas come out of things that annoy him. “What ticks you off?” Chances are you’re not the only one who feels that way. These are what entrepreneurs call “pain points”: either an unsatisfactory aspect of an existing product/service or something missing from it altogether. Often, this is where great opportunities reside. Start keeping a list of your observations: you don’t need to come up with solutions. And these observations need not be limited to your musical practice; this exercise is about developing your observational skills in general. As you get better, you’ll start seeing entrepreneurial ideas all around you, and you’ll be ready to apply your powers of observation to your musical world. A great way to both fund and publicize musical projects is by making them part of something larger going on in your community. Anniversaries, commemorations, activism, or awareness-building events can be potent ways to connect your music with an audience. One good way to keep aware of such opportunities is to keep up with your home-town media. There’s an incredible place to find opportunities going on locally, but if you’re unaware of them you’ll miss them. This is related to the previous item, but can be much broader than your local community. Music has great power to bring people together, to provoke conversation, to cultivate community. And that means that its power can operate in many settings. What issues are you passionate about? Are you wishing you could address climate change? Seek out environmental groups and see what sorts of programming they undertake. Might there be a way to incorporate music? Everybody loves centennials. What is coming up in the next few years? Use your imagination, get creative, and don’t underestimate music’s power to play a role in almost anything. Entrepreneurial thinking is not something in the genes; it’s a specific way of looking at the world around you, and it can be learned and developed. One of the interesting things that can come out of your “bug list” is this list may may you wonder why someone hasn’t solved these problems before. Sometimes it’s because there’s some technical or physical limitation that makes a solution difficult. But what if, rather than looking at that limitation as something to get around, we could figure out a way to make that limitation into a feature? It’s often difficult to find parking for major musical events. Rather than looking at the issue of access as an intractable barrier for an audience, musicians could turn this into an opportunity. What about an “art bus” that combines transportation with a fun pre-concert activity? Turning obstacles into opportunities not only solves a problem, but they tend to be just interesting enough that they garner attention and stimulate a buzz. Classical musicians and organizations have traditionally promoted themselves through simple awareness marketing: “Come to our concert on Saturday!” And while awareness is necessary for an established entity to bring in an audience (you’re going to miss Saturday’s concert if you don’t know about it), awareness alone will do little to support – much less help launch – an entrepreneurial endeavor. In order for people to pay attention to something new, the event has to deliver something of value, something that meets peoples’ needs in a new or improved way. Coming up with such a thing requires a paradigm shift, however. It requires the classical musician or organization to stop assuming that the value of the product is self-evident to the public and that the public simply needs to be convinced of their desire to come and listen. Instead, they have to invert their thinking to ask the question, “How can I use music to meet the needs and sensibilities of my audience? What can I do for them?” This can be difficult for some. Our entire musical training is grounded in a kind of veneration of our field. Shifting to an audience-focused world view requires recognizing that our veneration is not universal. Perhaps it’s even counterproductive. As I talk with early-career musicians about creating an entrepreneurial career for themselves, there’s often the misperception that an entrepreneurial mindset is some sort of mysterious, inborn trait. But entrepreneurial thinking is not something in the genes; it’s a specific way of looking at the world around you, and it can be learned and developed. So keep your bug list. Be aware of what’s going on around you. Look to build bridges. And don’t let the established barriers shut you down. Do these things, and you’ll start seeing how your music can serve others – and that’s where value resides. Jeffrey Nytch is a composer and leader in the arts entrepreneurship movement. 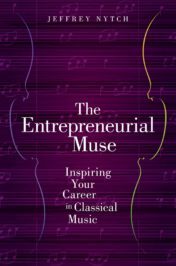 He serves on the faculty of The University of Colorado-Boulder and is the author of The Entrepreneurial Muse: Inspiring Your Career in Classical Music. It was entrepeneurs who robbed the 60`s-70`s musicians of all their money. Alen Klein also sold off the rights to al the Rolling Stones and Beatles recordings and printed music. Very few from that era were not robbed. Many abandoned managers to run their own affairs, with great success, so your guidance is probably welcome. In any case this was one of the key factors in alienating the young from capitalism. .